I’ve never dedicated an entire post to a frosting all on its own before. Usually the post is about a cake or cupcake primarily. Let this be a sign to you. You need to try this frosting. Swiss meringue buttercream is a heavenly concoction that I only recently discovered (and now am kicking myself for not trying earlier). It is rich, buttery (duh), and unbelievably silky smooth. The caramel buttercream from the banana caramel cupcakes was certainly a fabulous introduction to this type of frosting, but I wanted to try a classic plain vanilla as well. Put plainly, it is delicious. It would be a lovely accompaniment to just about any cupcake you can think of, and can also serve as a great base recipe for other flavors of buttercream. Simply lower the amount of vanilla extract and add in the other flavor you would like to incorporate (similar to the peppermint buttercream from these cupcakes). I also think this would be beautiful with the seeds of a vanilla bean mixed in, and a little less vanilla extract. Those black flecks against the beautiful white frosting would look just perfect! 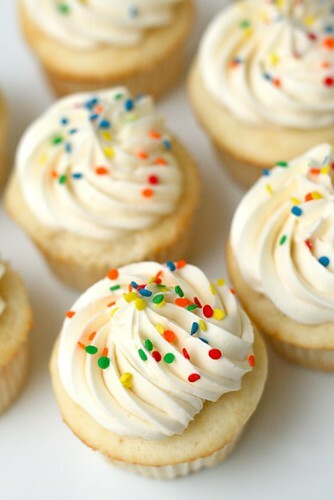 If you are going for the double vanilla combo, I have three vanilla cupcake recipes that I love. 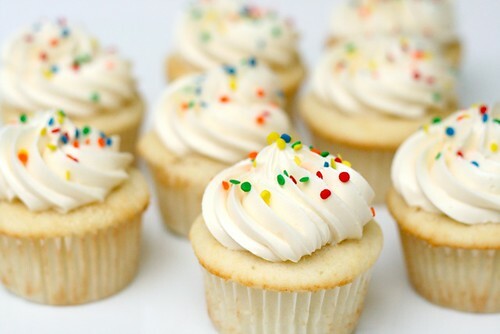 Vanilla bean cupcakes, Dorie’s perfect party cupcakes, and classic vanilla cupcakes. And, just writing about this frosting has made me crave it so much that you’ll have to excuse me while I go make some more. To make the frosting, combine the egg whites, sugar and salt in a heatproof bowl set over a pot of simmering water. Heat, whisking frequently, until the mixture reaches 160° F and the sugar has dissolved. Transfer the mixture to the bowl of a stand mixer fitted with the whisk attachment. Beat on medium-high speed until stiff peaks form and the mixture has cooled to room temperature, about 8 minutes. Reduce the speed to medium and add the butter, 2 tablespoons at a time, adding more once each addition has been incorporated. If the frosting looks soupy or curdled, continue to beat on medium-high speed until thick and smooth again, about 3-5 minutes more (don’t worry, it will come together!) Stir in the vanilla extract and mix just until incorporated. Tint with gel icing color as desired. Keep buttercream at room temperature if using the same day, or transfer to an airtight container and refrigerate up to 3 days or freeze up to 1 month. Before using, bring to room temperature and beat with paddle attachment on low speed until smooth again, about 5 minutes. Strong. Smart. Sassy. Lots of hobbies I love. 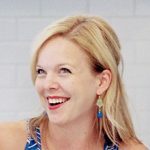 Excited to share my everyday with you.